^ Ursula Rao; John Hutnyk. Celebrating Transgression: Method and Politics in Anthropological Studies of Culture. Berghahn Books. 2006年: 94. ISBN 978-1-84545-025-0. ^ Merle Calvin Ricklefs. A History of Modern Indonesia Since C. 1200. Stanford University Press. 2001: 339–340. ISBN 978-0-8047-4480-5. ^ John Roosa. 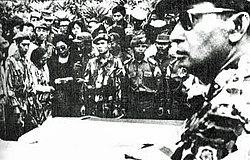 Pretext for Mass Murder: The September 30th Movement and Suharto's Coup d'Etat in Indonesia. University of Wisconsin Press. 5 September 2006: 69. ISBN 978-0-299-22033-4. ^ 8.0 8.1 Bandana Rai. Gorkhas: The Warrior Race. Gyan Publishing House. 2009: 238–239. ISBN 978-81-7835-776-8.